It's no secret that I adore, adore, Gail Carriger, her writing, and her characters. I had the pleasure of meeting her last year, and she was just as gracious and as courteous and as fun as I imagined her being. Her books are clever and witty and just a romping good time of a story. I was curious how her stories would translate into art form when I heard that there were manga versions of her books being released, and I'm happy to say that they translate marvelously. I think a lot of that has to do with Rem's artwork. She has a way of illustrating Ms. Carriger's humor fluidly onto paper, and her art is fresh and whimsical while at the same time being detailed and intricate. I'm thoroughly impressed with the entire presentation. 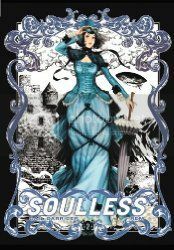 As for a review of the story itself, I'll direct you to my review of Changeless, the volume of the Parasol Protectorate this volume is based on. The entire team behind the manga versions have kept so well to the original story, that my original review will do. I'd recommend this book to fans of the original series or fans of manga or fans of a really well-written story, but would also recommend reading the volume one first, as this is a definite continuing story from one volume to the next.